The chiral purity of a drug is essential to its efficacy and safety. MRR is the only analytical technique that is fast, cost-effective, and capable of unambiguous identification and quantitation of diastereomers and enantiomers in crude reaction mixtures directly in the process flow. Unmatched resolving power and chemical specificity of MRR enable direct analysis of the crude reaction mixtures ‘as is’, without chemical separation or purification. 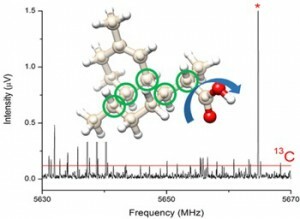 Rotational spectroscopy is emerging as the gold standard technique for spectroscopic determination of molecular structure backed by major improvements in instrument design and computational theory. For small-molecule APIs and intermediates, BrightSpec’s FT-MRR technology can identify components on the basis of their three dimensional structures without ambiguity, including resolving conformers, diastereomers, and enantiomers. Direct and unequivocal relationships between MRR spectral features and 3D-structural parameters of molecules enables identification of individual components in a chemical mixture, even if reference MRR spectra for pure individual chemicals are not available. Molecular Rotational Resonance (MRR) spectroscopy is a powerful alternative to Gas Chromatography (GC) for analysis of USP<467> residual solvents in pharmaceutical substances. High chemical specificity of MRR enables simultaneous analysis of residual solvents in multi-component mixtures without chemical separation to significantly decrease analysis time comparing to GC and eliminate any potential analyte co-elution problems. In addition to fast analysis, MRR offers fast and straightforward method development, requires essentially no consumables, and can be readily used online. The BrightSpec Headspace MRR Module, which can be combined with a CTC PAL autosampler, delivers high throughput and analysis reliability with little operator training. Mutagenic impurities pose a significant challenge for pharamaceutical analytical chemists, given that they are a health risk even at trace levels. Identification and quantitation of these (often unknown) impurities can be an onerous process. MRR provides fingerprint spectra of impurities based on the three-dimensional moments of inertia, and can be identified through comparison to BrightSpec’s spectral library, or even directly to quantum chemical calculations without a reference standard required. BrightSpec has developed a Thermal Evolution sampling method to release all volatile impurities in a solid sample, which delivers structural identification and quantitation in one measurement. This can dramatically speed up the impurities characterization and improve process control. Oxygenates, hydrogen sulfide, ammonia, and other polar contaminants may negatively impact a chemical process or be a health hazard, even at trace levels. Yet, these compounds are challenging to monitor using conventional analytical techniques, especially in complex matrices. MRR spectroscopy can selectively identify and quantify the polar contaminants through their unique rotational resonances at high resolution, without matrix interference. The spectrometer characterizes industrial chemical mixtures directly and returns quantitative results within seconds for gases or vapors, and within minutes for liquids or volatizable solids. Research applications of spectroscopy in the microwave to millimeter wave region of the spectrum are rapidly growing, including studies of molecular structure and bonding, reaction kinetics and dynamics, and astrochemistry, among others. BrightSpec provides an instrument product line for researchers that enables them to start their research faster – while leaving maximum flexibility for incorporating new sample chambers and methods. See: …>Journal Publications for a list of scholarly articles on pure rotational spectroscopy, including those by BrightSpec scientists and researchers using BrightSpec instruments. Molecular rotational spectroscopy is typically not included in the undergraduate instrumentation curriculum. BrightSpec is seeking to change that. 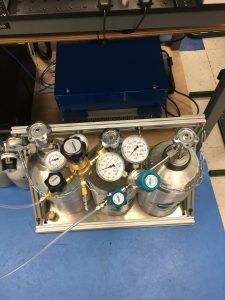 The capabilities of rotational spectroscopy to determine molecular structures in the gas phase, study reaction kinetics, and perform quantitative analyses of gas mixtures make it an excellent way to introduce students to the principles of spectroscopy in analytical chemistry. Product Flyer: BrightSpec Discovery K-Band FT-MRR Spectrometer.